Last Saturday, four of the Vintage Mafia girls and I had the absolute honour to be invited along as VIP guests at a very special edition of the Tweed Run. Regular readers will know that I’ve been on the two previous ones, in April ’10 and April ’11, and had an unbelievably awesome time on both. This time was a little different, because this autumn instalment of the annual ride was sponsored by a big brand. A very big brand. The Ralph Lauren Rugby Tweed Run was, as its name suggests, designed to create some serious buzz around the RL Rugby brand. They’ve just opened a shop in Covent Garden, one of the only two outside the US. The brand itself is a seriously premium one – full of lovely tailored and definitely vintage-inspired garments, at aspirational price tags. The shop itself is lovely, and full of very gorgeous assistants, so worth a visit if you’re in the area, at least. I will confess to being slightly worried about whether the corporate sponsorship would take some of the fun out of the fun and philanthropic Tweed Run. It’s not just a fun jaunt on bicycles in vintage clobber – it actually raises money for a very worthy cause – World Bicycle Relief, which donates bikes to children and adults in developing countries, enabling them to get to school and work. Anyway, I needn’t have worried. Aside from all the extra journalists and photographers, celebrities both major and minor (Erin O’Connor and some Made in Chelsea people), and a slightly more touristy route that meant a bit more stopping-and-starting, the day was as much fun as any previous Runs. Rather smashingly, the girls and I got gifted a RL Rugby jacket each, to form the basis of our outfits. 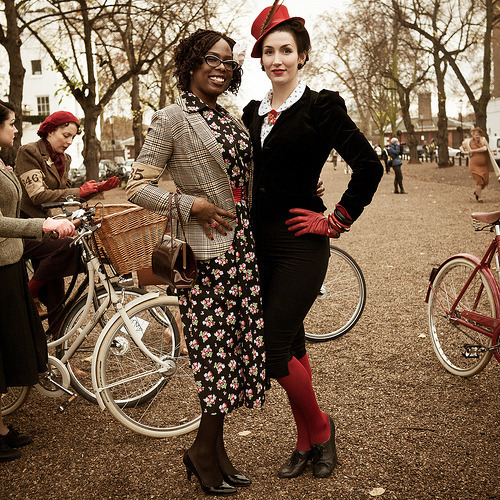 And even better than that, the kind folks at Pashley Bicycles sorted out three splendid steeds for Gemma, Jeni and Naomi to borrow, ensuring we all matched and looked (hopefully), rather spectacular together. Thanks you so much, chaps. The ride itself was lovely, taking us through Trafalgar Square, down Whitehall (or should have, if we hadn’t taken a wrong turn down the Mall and had to cut through Horseguards), through Hyde Park, stopping in Chelsea for tea. Then back over the bridges before ending at Hyde Park Corner for a party at the rather fancy Caledonian Club! Here’s a map of the route (and ride home to Bethnal Green), if anyone’s interested! It was relatively easy for me and for Bethan, as both of us cycle regularly. Bethan did twenty miles including the journey there and back… but the other girls did suffer from mildly bruised posteriors. My solution to this: more cycling, ladies! Here we are with our steeds. I had the pleasure of meeting some lovely people, including Lady Velo who is so amazingly elegant. She looked super in one of the new Vivien of Holloway styles – Runaround Sue. If you’d like to see more photos, there are some great ones over on Susie Bubble’s Style Bubble (she and Steve Salter were lovely, and I must apologise for telling a toilet-humour based joke in their presence), and Preposity.com, who has done separate posts on the gentlemen and the ladies of the Tweed Run. And if you’d like to see a bit more of the Run in video form and featuring us several times, then check this rather awesome video out. The song is going to be in my head all day now! Thanks a million to the ladies and gents of Pencil Agency who invited us along, Rugby Ralph Lauren for having us, the Tweed Run organisers for making it such a brilliant day, the Traditional Cycle Shop for providing the girls Pashleys for the day, and all the many great people we met for just being so dashed well-dressed. The Caledonian Club is pretty extraordinary, isn't it? I've had to go to work functions there and it is like stepping into another world! That looks like so much fun Fleur and your outfits look fabulous! Fabulous blog post on the day Fleur – it was so much fun, and an absolute joy to meet you! How lovely of RL to have you as VIP's also! See you in April I hope! Gosh this looks like so much fun! I will have to learn how to ride a bike for next years event! I think it may be me that prompted your copyright plea, as I recently syndicated your blog to my Livejournal account. I did this out of sheer laziness, because that's where I check the various blogs I read on a regular basis. I should have asked first and I know it – also it should come as no surprise, but I'd be even happier if you'd give me permission to keep it there! I came to your blog by way of a growing obsession with 1940s fashion, developed as an odd side-effect of having written a book set during WWII ("Code Name Verity" will be published in Feb. 2012 by Egmont Books). Here's the link to the livejournal syndication page. Again, please do let me know if you'd like me to remove it. that was meant to say: it should come as no surprise that other people have started reading your blog through mine! AND I also forgot to say that I now recognize you as the model in various fabulous outfits when my friends send me vintage fashion links. When I saw the jackets on Instagram I nearly asked what brand they were because they were so fabulous so thank you for posting this! Looks like you ladies had a wonderful time! You gals in the Vintage Mafia are always my favorite fashion inspiration across the pond! You all look absolutely fabulous, so stylish and quirky, well done, ladies. I love those jackets but I'd have to rob a bank to afford one! this looks like so much fun!You all look fabulous! LOVED the video, loved how stunning you and yours looked. Want a ticket for London now . . . I do think it a great shame that a traditional & free spirited eccentric English event is now sponsored by a massive American corporation who sell clothing & other goods inspired by English style (a very aspirational, romanticized & expensive version thereof). Oh the Irony. I'm afraid that is the end of the Tweed Run for me. Splendid photos! Thanks for sharing!